Note: Lopez McHugh is no longer accepting cases involving Yaz, Yasmin, and/or Beyaz. On April 10, 2012, the FDA announced that new warnings are required for Yaz, Yasmin, Ocella, and Beyaz. The new warnings report for the first time that studies have shown that these drugs have up to a 3 times higher risk of blood clots than other birth control pills. Whether or not this is related, Bloomberg reported recently that 500 cases have settled, at an average of $220,000 per case. If you suffered blood clots while taking Yaz, then call today for a free case evaluation, because you may be running out of time to file a Yaz or Beyaz lawsuit. 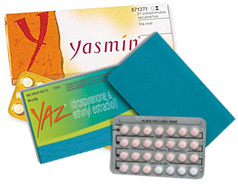 Yasmin, Yaz, and Ocella are all birth control pills manufactured by Bayer Healthcare. Ocella is a generic form of Yasmin, marketed and distributed by Teva Pharmaceuticals. Yasmin was approved by the FDA in 2001, Yaz in 2006, and Ocella in 2008. Studies sponsored by Bayer Healthcare were designed in such a way that that no increased risk of clots was found. The Yaz group of drugs contains a compound created by Bayer called drospirenone, a synthetic progestogen that may elevate the levels of potassium in the body. Side effects of drospirenone and/or elevated potassium include heart attack, stroke, pulmonary embolism, blood clots, and even death. If you experienced any of these side effects while taking Yaz, Yasmin, or Ocella, please fill out the form to the right for a free case evaluation. If you would feel more comfortable speaking to someone, you can call our toll-free number, 877-703-7070, to have an attorney review your information. The Yaz drugs are also prescribed to treat acne and premenstrual dysphoric disorder (PMDD), a severe form of PMS that includes premenstrual water retention and bloating. Drospirenone acts as a diuretic and can lead to dehydration, which in turn can lead to blood clots and gallbladder damage. Several studies show that Yaz, Yasmin, Ocella, and other drospirenone-containing birth control pills are more likely to cause blood clots, pulmonary embolism, and stroke than other birth control drugs. Most recently, on May 31, 2011, the FDA announced that it was investigating new information about the safety of these pills. Meanwhile, the corresponding agency in Europe, the European Medicines Agency, has already determined that the warnings are inadequate in light of this new information. For more information about these risks, click here.